However, more than 98% of these households also own a chulha. Surveyors asked if food items — roti, rice, sabzi, dal, chai and milk — had been cooked on the chulha or the gas stove on the previous day. They found that only 27% of households exclusively used the gas stove. Another 37% reported using both the chulha and the gas stove, while 36% made everything on the chulha. The trend is more acute among those who received an LPG connection from the government; almost 53% exclusively used the chulha, while 32% used both. “Ujjwala beneficiaries are poorer, on average, than households who got LPG on their own. Refilling the cylinder is a greater fraction of their monthly consumption, and they may be less likely to get a refill immediately after a cylinder becomes empty,” says the report, suggesting that higher refill subsidies and monitoring may help to change behaviour. Gender inequalities also play a role. Surveyors found that almost 70% of households do not spend anything on solid fuels, meaning that the relative cost of an LPG cylinder refill, even if subsidised, is far higher. Women are more likely to make dung cakes, and while men are more likely to cut wood, women are often the ones collecting and carrying it. The study argues that these women, who do the unpaid labour needed for “free” solid fuels, are not typically economic decision-makers in the household, hindering a shift to LPG usage. Most of the survey respondents agreed that it was easier to cook on a gas stove, but felt that food cooked on the chulha — especially rotis — was tastier. 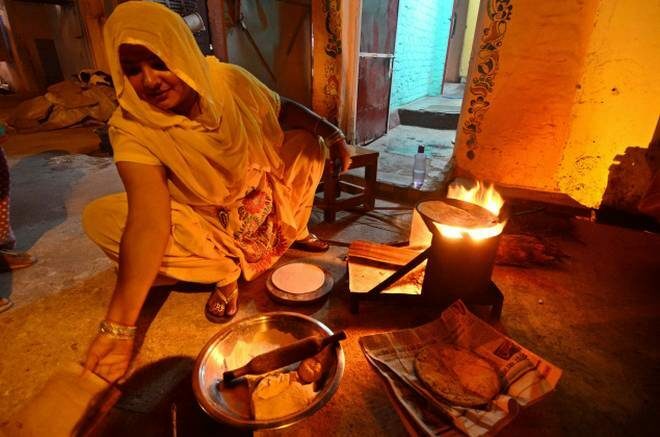 The survey found that while 70% of respondents thought the gas stove was better for the health of the cook (typically a woman), more than 86% felt that cooking on the chulha was better for the health of those eating, reflecting ignorance of the fact that ambient air pollution is harmful even to those who are not cooking the food. Be the first to comment on "About 85% of Ujjwala beneficiaries in four States still use earthen stoves"